In terms of science & religion, it is fascinating to see Kepler, Newton and their contemporaries struggle to balance their mechanistic ideas with the need for an active God. Kepler, of course, was also into all sorts of numerical mysticism (and Newton into alchemy and eschatology), and it is a small wonder that planetary laws, now known as Kepler's Laws, were rescued from his search for numbers in the heavens. Did anyone ever receive a more exquisite New Year's gift than was given to the German scholar Johannes Matthäus Wackher von Wackenfels, 400 years ago? A booklet of just 24 pages, it was written in 1611 by his friend Johannes Kepler, court mathematician to the Holy Roman Emperor Rudolf II in Prague. In De nive sexangula (On the Six-Cornered Snowflake), Kepler attempts to explain why snowflakes have their striking hexagonal symmetry. In his introduction, Kepler writes that he had noticed a snowflake on the lapel of his coat as he crossed the Charles Bridge in Prague, and so came to ponder on its remarkable geometry. This charming, witty work seeded the notion from which all of crystallography blossomed: that the geometric shapes of crystals can be explained in terms of the packing of their constituent particles. Kepler's analysis of the snowflake comes at an interesting juncture. It unites the older, Neoplatonic idea of a geometrically ordered Universe that reflects God's design with the newly emerging mechanistic philosophy, in which natural phenomena are explained by proximate causes that may be hidden, or 'occult' (like gravity), but are not mystical. “There must be a cause why snow has the shape of a six-cornered starlet,” Kepler wrote in De nive sexangula. “It cannot be chance. Why always six? The cause is not to be looked for in the material, for vapour is formless and flows, but in an agent.” This 'agent', he suspected, might be mechanical: the orderly stacking of frozen 'globules' that represent “the smallest natural unit of a liquid like water” — not explicitly atoms, but as good as. Kepler asserted that hexagonal packing “will be the tightest possible, so that in no other arrangement could more pellets be stuffed into the same container”. This assertion about maximal close-packing is known as Kepler's conjecture. It was proved using computational methods only in 1998, by US mathematician Thomas C. Hales, whose proof was published 7 years later (Ann. Math. 162, 1065–1185; 2005). Kepler's vision of crystals as stackings of particles also informed the eighteenth-century mineralogical theory of René-Just Haüy, which forms the basis of all crystallographic understanding today. Yet in the end, Kepler is defeated by the snowflake's ornate form and plate-like shape. 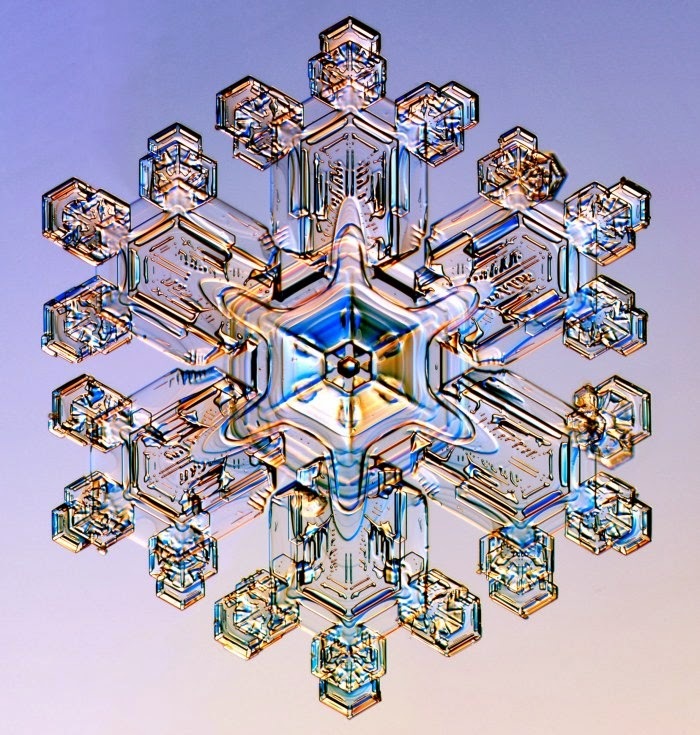 He realizes that although the packing of spheres creates regular patterns, they are not necessarily hexagonal or flat, let alone as ramified and ornamented as that of the snowflake. 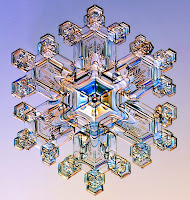 His failure to explain the regularity of the snowflake is no disgrace, for not until the 1980s was this seen to be a consequence of branching growth instabilities biased by the hexagonal crystal symmetry of ice. Kepler instead fell back on Neoplatonic occult forces. God, he suggests, has imbued the water vapour with a “formative faculty” that guides its form. There is no apparent purpose to the flake's shape, he observes: the “formative reason” must be purely aesthetic or frivolous, nature being “in the habit of playing with the passing moment”. That delightful image, which touches on the late Renaissance debate about nature's autonomy, remains resonant today in questions about the adaptive value (or not) of some complex patterns and forms in biological growth. I actually like his options of "aesthetic" or "frivolous". But this reliance on some 'occult forces' reminded me about debates on some of the (as yet) unexplained 'origin' questions: Origin(s) of life and origin of the universe. Just because there is no definitive theory yet, for many, this has become the place to insert God or some other supernatural force in there. Kepler at least tried to find the answer himself, and his efforts benefited the later sciences. Unfortunately, most of the "God of the Gaps" enthusiasts today are non-scientists and they are only interested in showing that an explanation is not possible. I wonder how Kepler would approach today's "origins" questions. I bet he won't give up so easily. There is a recent Huffington Post article in which Kepler is invoked as opening the way for the death of Intelligent Design. Basically his approach is described as look for an answer even when you can't find one and don't stop with "God did it ". Thanks Gary. I think this is precisely the difference between the attitude of ID folks and Kepler. Thanks for the link!